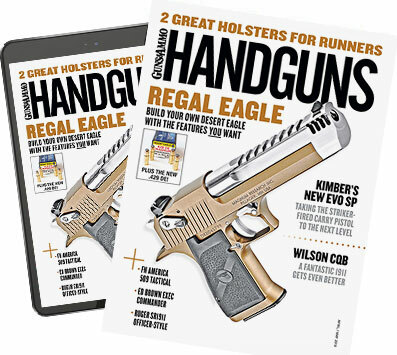 In 1949, Bill Ruger wanted to produce and market a .22 semiautomatic handgun. He acquired a Japanese Nambu from a returning Marine and duplicated the gun in his garage, calling it the “Ruger Baby Nambu.” He later modified the design—changing the profile but retaining the Nambu’s basic operation—but he lacked the money to pursue his dream. He approached his wealthy friend Alex Sturm, who immediately jumped on the bandwagon with a contribution of $50,000 to produce the gun, which they named the Standard model. Aimed at hunters and target shooters, it was priced at $37.50, which was much less expensive than the competition. It sold well because of its resemblance to the famed German Luger pistol—although Bill Ruger later said the Colt Woodsman was also an influence. Ruger was able to keep manufacturing costs down by forming the receivers from two stamped sheet metal parts welded together, and he used coiled springs made from piano wire as opposed to the customary flat springs. And instead of a slide like that found on John Browning’s designs, Ruger’s blowback-operated gun employed a cylindrical bolt that cycled within a tubular receiver. Most novel to this gun was a pair of “ears” sticking out from the rear of the bolt to aid in charging the gun. The bolt was left in the white and finished smooth; the exterior featured a polished blue finish. The gun was originally offered with a 4.75-inch barrel, but in 1954 the barrel length was changed to six inches. The gun has a manual, 1911-type thumb safety, and the bolt can be locked open via this safety. A mere snick of the lever downward allows the bolt to move forward. My gun was built in 1974, and to this day the action closes with a resounding “clunk.” The bolt does not lock back after the last shot; this was later corrected on the Mark II. The gun’s nine-round magazine sports a lock at the base of the grip frame. The original chrome-plated trigger was listed as a two-stage. The trigger on mine still breaks at four pounds even and seems to get better every year. 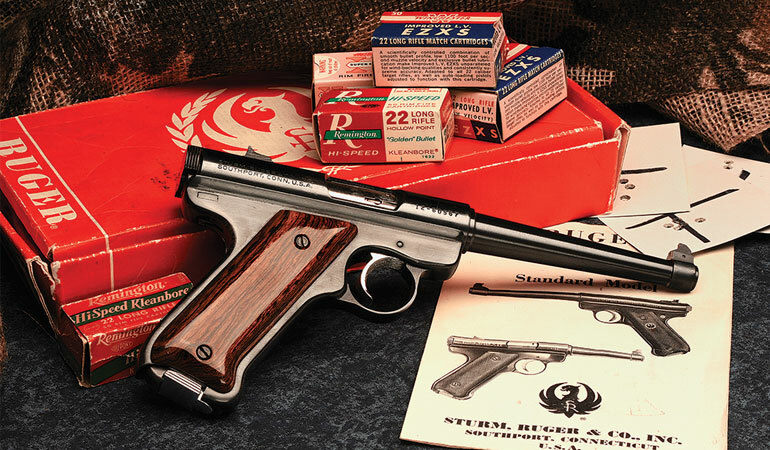 Ruger’s .22 pistol has undergone numerous changes over the years, and it continues to sell in the thousands each year. I think it will be a favorite for decades to come, thanks to the genius of Bill Ruger.